The 4 million sqm city, is set to be powered entirely by renewable energy, served by electric vehicles and will take 30 years to build. 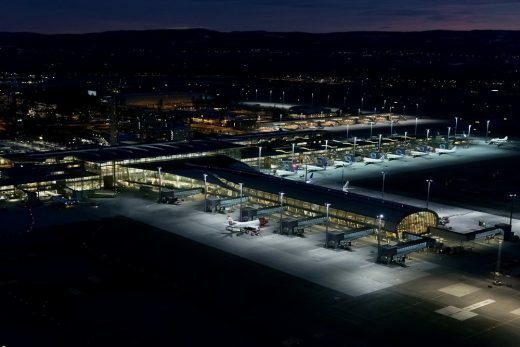 The scheme is being developed by Norwegian development vehicle Oslo Airport City. The expansion doubles the size of the existing terminal building with the addition of a new, 300m long pier. The practice continued the timeless architectural expression and rational simplicity of the original airport – which the practice designed in 1998 – whilst introducing new design elements to enhance the passenger experience. 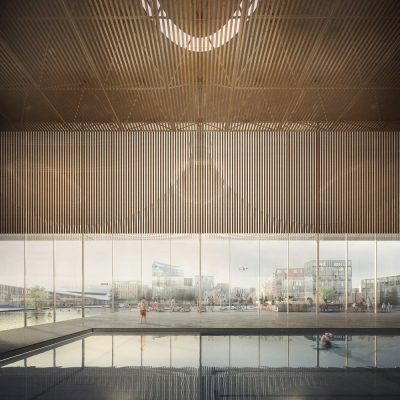 London and Oslo based Haptic Architects and NORDIC – Office of Architecture, in collaboration with Gross.Max Landscape architects, have won the architecural competition to create a new urban centre and a public square in Straume. Straume, in the municipality of Fjell, is located on the west coast of Norway, near Bergen. This Norwegian architectural competition was commissioned by Sartor Holding. The Astrup Fearnley Museum of Contemporary Art reopened in Tjuvholmen, Oslo. Previously located at Dronningensgtate 4 for 18 years, the privately owned museum is now part of the new Icon Complex, developed by Selvaag Gruppen and Aspelin-Ramm Gruppen, and designed by Renzo Piano Building Workshop in collaboration with Narud Stokke Wiig architects. The new Hanimaadhoo International Airport, designated as the country’s second international gateway, is located on an island with very limited land mass for an international airport of this size. With airfield infrastructure consuming nearly all the available land our concept of a “floating terminal” has been selected by the Government for its innovative, exciting and eco-friendly approach. The proposed terminal is built entirely on stilts over water without reclamation to preserve the existing environment and the natural coastline. February 20, 2018 in Architects.